New Epic / Voter ID Card Registration Application Process Online, Correction of Voter ID Card, How to get new Voter Card Epic? Voter ID Card (Voter Identity Card / EPIC Card) is one of the proofs that we are an Indian Citizen along with Driving License, PAN Card. But, Voter ID (EPIC) Card is one & only Identity that allows to Vote our favourite one during Election. People, on & beyond 18 years of age, are eligible to apply for New Voter ID Card in India. Here we will check out few details regarding Voter ID Card Issue, Correction & Online Voter Card application process. You are now 18 years of age & want to know how to apply for New Voter ID Card? Are you looking for New Voter Card Application Process Online? How to get your name registered for new Voter Card? 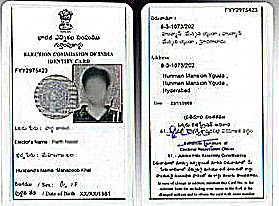 Indian Citizen, who are eligible (18 years of age on prescribed date) for registering & getting their New Voter ID Card, should visit their Area’s Vote Kendra with recent photograph, age proof & address proof during the scheduled date announced by Election Commission for Issuing & Correction of Voter ID Card. If you are going to Vote Kendra for registering your name as Voter and want to get your New Voter ID Card (first time Voter Name Registration) then you should use Form No.6 and advised to carry your photo & other relevant documents like Age Proof, Address Proof etc. If you want to register your name as New Voter & want to get New Voter ID Card Application Form online then visit http://ceowestbengal.nic.in website. You may Download Application Form or may apply online for new Voter Card. Spelling mistake on your Voter ID Card? Wrong address / age mentioned on your Voter ID Card? Do you want to make correction of your Voter Card? How to rectify / correct / change mistakes of Voter ID Card? Can you apply online for correction of Voter ID Card? Indian Citizens having mistakes on their Voter ID Card can correct the wrong information mentioned. Correction of Voter ID Card Details is possible through Online process & for that you required to visit http://ceowestbengal.nic.in website. You may download application form for Correction of Voter Card or may collect Form from the Vote Kendra of yours. Please follow, TV News or Newspapers to know when actually the Correction & Issuing of New Voter ID Card process starts at your area. Normally, Issuing & Correction of Voter ID Card process starts few months prior to Election of your region. New Voter ID Card Issue i.e., to get new Voter ID on your name – one should use the Form No.6. New Voter ID Card Name related compliant i.e., if any Voter ID Card issued on a name that shouldn't be done and you want to compliant regarding that then you should use Form No.7. Voter ID Card Correction i.e., if there is any mistake in your Voter ID Card like Name Spelling mistake, Address mistake, Age mistake etc. ; then you should use Form no.8 for the Correction of Voter ID Card details. Changing the Part no. of same Bidhansabha (Constituency) i.e., if you have changed / shifted your house (address) in the same Constituency (Bidhansabha area); then you should use Form No. 8a. Election Commission of India has started sms & calling process for the people of India to know their Voter ID Card details. If you want to know your Constituency Name & Details of your Vote Kendra then you required to send a SMS writing only the ‘Voter ID Card Number’ to 94336-33333 number. You will receive a SMS mentioning your Vote Kendra, Constituency details etc. For further details on Voter ID Card please visit http://ceowestbengal.nic.in website now. Make your Voter Card and utilize your right.